(Player's Choice) 2004 €? ? (Sold Out) 200x £? ? For the eponymous song, see Sonic Heroes (song). 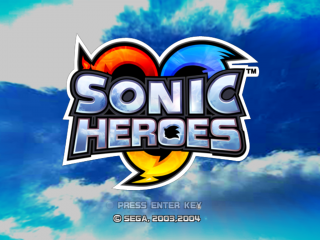 Sonic Heroes (ソニック ヒーローズ) is the third 3D Sonic game to hit the Nintendo GameCube. Sonic Heroes is also the first game to go multiplatform for all systems. The phrase "Sonic Heroes" refers to the uniting of the heroes of the Sonic the Hedgehog series. This game also marked the return of the Chaotix, a group last seen in Knuckles' Chaotix on the Sega 32X (except for Mighty the Armadillo). The level design and graphics were given a more cartoon-ish quality which is reminscent of the old-school Sonic games. The game was developed using the RenderWare engine so that the game could be programmed and ported easily for the multi-platform release. This made for fairly consistant ports, quality wise, between all the systems. The PlayStation 2 version did suffer from clipping and graphic faults, not to mention a lower frame rate, making it the least well recieved of the ports. Primary development was done on the Nintendo GameCube, and then ported to the Xbox and PlayStation 2. The PlayStation 2 version was later re-released on PlayStation 3 through PlayStation Network. Dr. Eggman has come back to challenge Sonic and crew again to defeat his new scheme. Sonic, Tails, and Knuckles gladly accept and race off to tackle the doc's latest plan. Meanwhile, Rouge the Bat swings in on one of Robotnik's old fortresses and discovers Shadow in capsule. After an odd encounter, Rouge, Shadow, and E-123 Omega join up to find out what happened to Shadow and to get revenge on Robotnik. At a resort, Amy looks at an ad that shows Sonic in it with a chao and a frog. After getting over boredom, Amy, Cream, and Big decide to find Sonic and get what they want back. Elsewhere, in a run down building, the Chaotix get a package that contains a walkie-talkie. Tempting them, Vector, Charmy, and Espio decide to work for this mysterious person, so they can earn some money. The game introduces several new gameplay elements. Unlike past Sonic games, which have only one character playable at a time, the player is able to control three characters and switch between them freely, whilst the other two follow. Each character has a unique ability which it contributes to the team. There are three types of characters that are used in gameplay. One party member is a "fly" type, able to ascend short distances with the other party members. The second type is "speed." This character can move faster than the other two and has a homing attack. The final brand of hero is "power," the character that has the most strength. Each ability is also represented in the interface by color; blue for speed, yellow for flight, and red for power. These groups of three characters are called "Teams" and the selection of characters in each team is pre-determined. It is not possible to mix and match characters between teams. Each team also has a Team Blast skill, which can be performed when the Team Blast meter becomes full. This can be achieved by performing such actions as destroying enemies or collecting rings. Each team follows a different, yet intertwined, storyline. This team and associated levels are designed to be of medium difficulty, and contain high-speed sections. Their Team Blast consists of Knuckles throwing Tails, who spins to gain momentum, and throws Sonic, who attacks surrounding enemies multiple times. During the final boss, each team member, under Super Transformation, performs the same attack as Sonic. This team and associated levels are designed to be of hard difficulty, requiring skill and concentration to endure heavy battle. Their Team Blast consists of Shadow performing Chaos Control, whilst Omega, lifted up by Rouge, fires large lasers whilst rotating the top half of his body. It also freezes time momentarily once complete, so that all enemies are frozen in place. This team and associated levels are designed for younger players, with shorter missions. Their Team Blast sees Big bouncing Amy and Cream on top of his umbrella with a shower of flowers raining down on them. All three members level up by one and grants them temporary invincibility, high running speed, and a shield. This team and associated levels provide a different experience, as most are mission-based, and are only complete when the mission target is met. Their Team Blast sees Espio, Charmy, and Vector singing and playing instruments badly, causing all of the surrounding enemies to explode, whilst ring bonuses are received for each enemy destroyed. Collecting rings also refills the gauge, potentially allowing the player to perform another Blast immediately after the first is complete. Much like the 2D games, Sonic Heroes has a 2 act and boss structure. Unlike those games, the levels are not named Act 1 and Act 2 (though the Special Stages are labeled as such) but they function in a similar manner. Each set of 2 stages are based around one of the classic Sonic level themes. The game requires that all 4 teams complete all of the stages and get all 7 Chaos Emeralds before progressing to the Last Story, where all 4 teams participate. Sonic Heroes has a multitude of minigames for two players to compete in, similar to the multiplayer mode in Sonic Adventure 2: Battle. At the beginning, only Action Race is available, but more minigames can be unlocked by collecting Emblems in the single player mode. Every minigame has three dedicated stages to choose from, and if "ALL" is selected, then both players play a best-of-three match. Action Race 0 The objective of this minigame is to reach the Goal Ring before the opposing team does. This is the only mode available from the beginning of the game. Battle 20 In this mode, both players' teams battle against each other to force each other off the edge of the stage. The first team to force all three of the opposing team's members off the stage is the winner. If the battle goes on for too long, it is declared a draw, and both teams must fight again. Special Stage Race 40 In this mode, both players race through a Special Stage to pursue the fleeing Chaos Emerald before it reaches the end of the stage. The first team to claim the Emerald is the winner. Ring Race 60 In this mode, both teams compete to collect the most Rings within the time limit. Players may attack each other to push them back or to make them drop rings. Bobsled Race 80 In this mode, both players control a team each riding on a Bobsled on specially-designed courses. To win, a player must complete three laps of the stage before the other player can do so, or survive longer than the other player. Any teammates lost from crashing into obstacles are restored on the next lap. Quick Race 100 This mode is similar to Action Race, except the stages are shorter. The Goal Ring is placed in the middle of the stage with both players starting on opposite ends of the stage, and both players must race through mirrored layouts seperate from each other. Cream the Rabbit was originally designed to first appear in Sonic Heroes; however, when Sonic Advance 2 was announced in 2002, Sonic Team decided that it would be a good idea to introduce her there first, as to make Sonic Advance 2 feel fresher. This is the first game the Chaotix has appeared in since 1995. Takashi Iizuka has been quoted saying he considers this new, re-designed Chaotix his creation, as the original Chaotix from 1995 was created by a different artist at Sega of America. Sonic Heroes was combined with Super Monkey Ball Deluxe for Xbox as a Platinum Family Hit. Although the plot for Sonic Heroes is somewhat sparse, a large portion of it is a set-up for 2005's Shadow the Hedgehog, especially Team Dark's story. In the opening scene of Team Chaotix's story, there are pinned papers on a notice board behind Vector, showing concept drawings of the robots used in the original Sonic game. The stage "Frog Forest" is very similar to the Sonic & Knuckles stage, Mushroom Hill Zone. Knuckles points out one of the similarities; during flight with the flower on that stage, he mentions that there are also large mushrooms on Angel Island, but that they are smaller than those of Frog Forest. Throughout the course of the game, there were a few cutscenes where the dialogue was grammatically incorrect. The first scene is during Team Sonic's story when they're getting chased by rocks; Knuckles will say, "Looks like it's buddy has joined the party! ", when it should have been "its". The second scene is where Tails will state, "Look at all of those Eggman's robots! ", in another scene Robotnik says, "Witness this invincible battleship, built by the hands of a genius! It's power, unmatched through the universe!" The last one is during Team Chaotix's story when they are facing off against the Egg Emperor. Vector says "It looks like we're in a jam boys." but the text says "Looks like we're in jam boys." They left out the 'a'. If one stands around for a while when playing as Team Chaotix, Vector will say "I forgot to pay the electric bill back at the office." Charmy will also say "Can we go now?" in non boss battle levels depending on the character who earned the most points (and possibly the most power cores) will say a phrase depending on the rank e.g. Amy - A rank - "We're like awesome or Sonic - E rank - "Shoot not my day"
Amy: "This weather reminds me of our last attack on the Egg Carrier!" (allusion to Sonic Adventure) in Final Fortress, even though she was not actually part of the attack and was only on the Egg Carrier because she had been kidnapped. Amy: "This place reminds me of Casinopolis!" (allusion to Sonic Adventure) in Casino Park, even though she never actually entered the Casinopolis stage during the course of Sonic Adventure. It should be noted that she does not mention Casinopolis in the Japanese version of this game. Knuckles: "We have jungle mushrooms on my island too, but not this huge!" (allusion to Mushroom Hill Zone from Sonic & Knuckles) in Frog Forest. Shadow: "Space? Did you say SPACE?" when replying to Rouge who said, "We might even be at the edge of space." (allusion to Shadow's "fatal fall" from space in Sonic Adventure 2) in Egg Fleet. Shadow: "Some things never change, do they?" as a response to Rouge mentioning going after the Master Emerald at the end of Team Dark's story (allusion to Sonic Adventure 2). Metal Sonic: "I was created for the sole purpose of destroying you," when addressing Sonic (allusion to Sonic CD) in Metal Overlord. Knuckles: "The Egg Carrier is nothing compared to this!" (allusion to Sonic Adventure) in Final Fortress. Big: Big's quest for Froggy is reminiscent of his story in Sonic Adventure. In addition, the giant frogs in Frog Forest and Lost Jungle appear to be the same as Froggy. Rouge: "I haven't heard from the President lately." (allusion to Sonic Adventure 2) while the player stands still for a while on any stage. E-123: "I couldn't even beat Gamma or Beta..." (allusion to Sonic Adventure) when completing a stage with an E-rank. This is one of the final Sonic games in which the voice actors from the Sonic Adventure games recorded their voices. Newer games in the series, from Shadow the Hedgehog on, are recorded by the cast of Sonic X. Many Sonic fans were angered by the change and have sent demands to Sega to rehire the original voice cast from this game and the Sonic Adventure series. Some people say this, however, is unlikely to happen, especially considering the passing of Deem Bristow who voiced Dr. Ivo "Eggman" Robotnik in this and all previous 3D Sonic games. Sonic and Metal Sonic are voiced by the same actors in both the English and Japanese versions. The GameCube and PC versions feature only one voice track in the disc (discs in the case of the PC version) and according to the regional version, due to size constraints. The Western versions have the English voice language whereas the Japanese version has the Japanese one, while the text language is entirely multi-lingual and manually selectionable in all regional versions. Since the PC version requires to be installed in the hard disk, it is not a difficult task to swap the voice files in order to have the desired voice language. 1,080,000 The Magic Box - US Platinum Videogame Chart PS2 US "
This page was last edited on 2 April 2019, at 10:27.